This full color, 32 page, pocket sized (8.25 x 4.25 in.) brochure explains the “Nature Based approach to maintaining golf courses with descriptions of two U.S. courses managed totally organically. 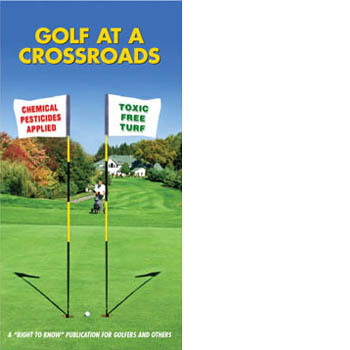 In sections on chemical pesticides used on golf courses, it discusses the potential hazardous effects of pesticides on human health, pets, wildlife, soil and water. It provides detailed tables outlining the 29 chemical pesticides most commonly used on golf courses. Although Golf at a Crossroads is written primarily for a non-technical audience, its sources are thoroughly documented in an appropriate scientific fashion – with footnotes, references, and a list of recommended resources. It was written with input from golfers, golf course superintendents, toxicologists, engineers, regulators, and ecologists.